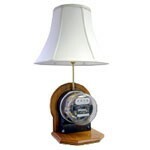 A great gift for retirements, birthdays or any occasion, our 25” watthour Meter Lamp comes in your choice of oak, cherry or mahogany wood finishes and a cream fabric shade. Custom wood bases are designed to accommodate brass plates to engrave names and dates. The meters are refurbished Westinghouse CA or GE I-30A dating from 1935-1954.